We are having lovely fall weather here in Arkansas and most of the leaves are down off the trees but not all. There is still some great color around and I love the piles of leaves… but not the work involved in picking them up! 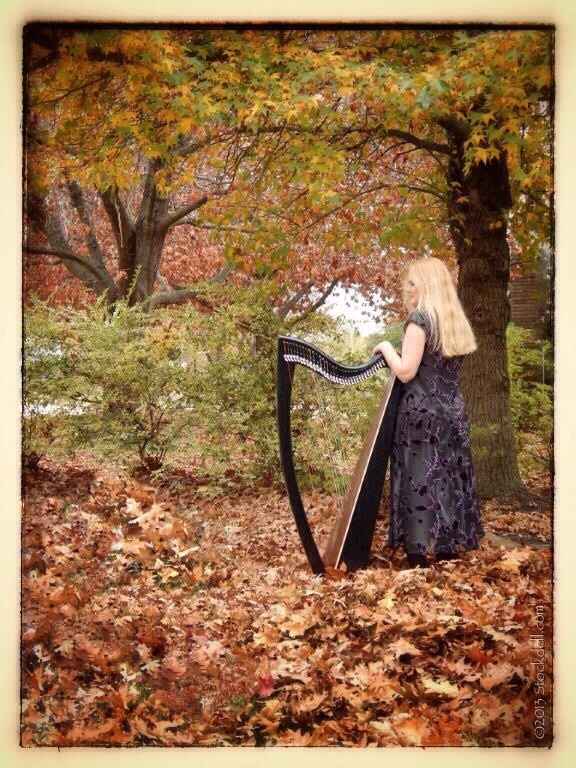 Anyway, I decided to take my harp and my wonderful new dresses from Bonner-Bell out into the leaves for some pictures. I had a ton of fun working on the photos even though it is hard to be both model and photographer. I felt like I got my daily workout between raking leaves into place and running back and forth between the harp and the camera. When my husband got home I showed him the pictures which he loved and he could tell that I had had fun on the project. His response “too bad you don’t like your job!” I know!! I’m sincerely spoiled and grateful that my day at the office involves frolicking in leaves.